Cut the needed pieces for your model. Sew the pieces together. Zig zag the ends to stop the webbing from fraying. 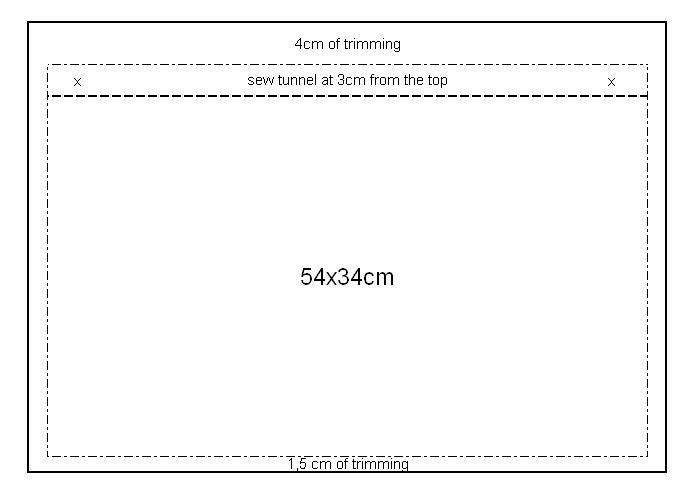 You should end up with a piece that measures 57 x 39,5cm, including trim. The following graphic shows you where your final piece has trim, the upper sewing line and where the button holes will be placed. Cut also a 4,4 x 6cm big piece of cloths in a matching or contrasting colour for the holder of the eyelet and fold 1,3cm on the right and 1,3cm on the left to the back so that they overlap. Now sew from the “good” right side over the strap in zigzag stitch. This will look nice on the right side and hold together the overlapping back side part. You should end up with a strap that is about 1,8cm wide and 6 cm long. Slip it through the eyelet and fold it in half. 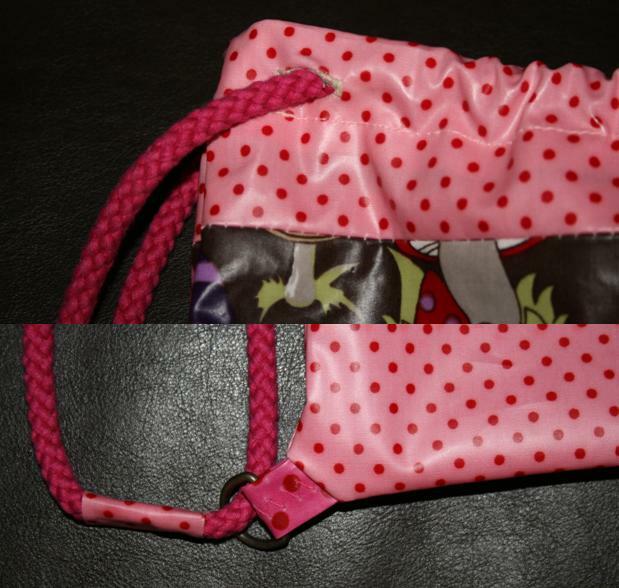 Now sew button hole on the upper side of your bag. You need two button holes that should be 2cm long and should start at 2,5cm from the side and 5cm from the top. Have a look at the schematic drawing. The button holes go where the X s are. Now fold your prepared piece in half so that the outer sides of the oil cloth are facing each other, place the prepared strap with the eyelet on the open corner of the bag so that it faces the inside. Now sew the bag together. You can add an extra back and forth sewing where the strap. Then turn it to the right side. Now fold 4cm of cloths to the inside on the top. If you use oil cloths there is no need to fold it twice to look clean. It is enough to just zig zag the ends to stop the webbing from fraying. Your button hole should now be about 1cm from the upper edge on the outside. Now sew at 3cm from the upper edge. Like that you create a tunnel of 3cm with two opening button holes. Now you can insert the cord through a button hole, thread it through the tunnel created in step 5 and then connect both ends of the cord either with a simple knot or like I did by glueing them together with adhesive tape, than zig zaging over this connection, sewing it tight together, and then decorating this connection by glueing a small matching pieces of oil cloths around it. That is it. Simple, easy and done in about an hour. If you have any questions, let me know. And if you use this pattern it would be great to have links to pictures of your model here in the comments. 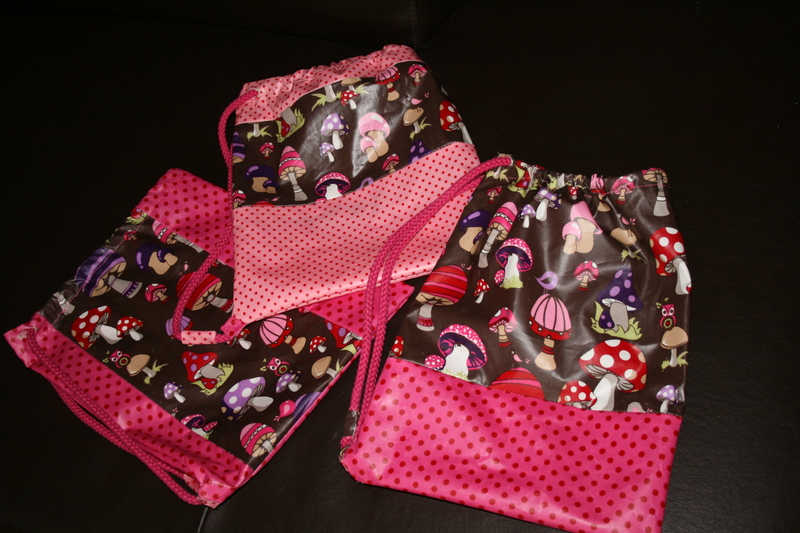 This entry was posted in Sewing and tagged Pattern, sewing, Sports Bag, Tutorial by kathatravelling. Bookmark the permalink. This is awesome! Bookmarking this for when my goddaughter starts school. Thanks! And you can make it in an hour. It is just so easy.